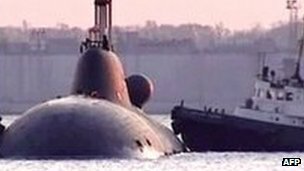 A retrial has begun in the eastern Russian city of Vladivostok of two men accused of causing an accident on a nuclear submarine in which 20 people died in 2008. Another 21 people were injured when the K-152 Nerpa’s fire extinguishing system was activated, releasing a deadly gas. Captain Dmitry Lavrentyev and engineer Dmitry Grobov are accused of causing “death by negligence”. They were acquitted last year, but the verdict was later overturned on appeal. The two men deny responsibility and blame faulty equipment for the accident in November 2008 in the Sea of Japan. The first session of the retrial focused mainly on procedural questions, and the trial was later adjourned until 20 December. In 2008, the submarine’s fire extinguishing system was apparently activated without warning while the vessel was undergoing tests in the Sea of Japan. The fire extinguishing system – typical on Russian submarines – uses the gas freon, which suppresses fires quickly by displacing oxygen. But it can also be lethal for any crew members who are still in the area when the gas is released. All those who died on Nerpa are thought to have suffocated. It was the worst accident involving a Russian submarine since the sinking of the Kursk in 2000 when 118 people died. This entry was posted in The world's submarines and tagged K-152, Nerpa on December 11, 2012 by jasonlockley.